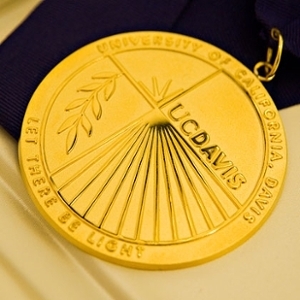 The UC Davis Medal is the highest honor the University presents to individuals in recognition of extraordinary contributions that embody the campus’s Vision of Excellence. Medalists inspire and support the success and engagement of our students, faculty, staff and alumni, and foster a bold and innovative spirit in teaching, research and public service. The UC Davis Medal recognizes individuals of rare accomplishment, “to be heralded today and in perpetuity,” as extraordinarily special members of the UC Davis community. The design of the UC Davis Medal represents, both figuratively and literally, the legacy of contributions UC Davis has made to the world in research and scholarly endeavors. Depicted on the medal are the campus name and its motto, “Let There Be Light.” In the upper left quadrant are the life-giving rays of the sun. Below them, leaves of the bay laurel symbolize our proud history of achievement. Lines in the lower right quadrant may be seen as energy radiating from a source, roads leading to the future, or rows of crops in fertile California fields. The spare, relatively unadorned design, which employs an official campus typeface, Futura, is timeless and distinctive. Jan Conroy, Class of 1977, designed the medal during his long career in university graphics, publications and communications. Jan retired in 2012. 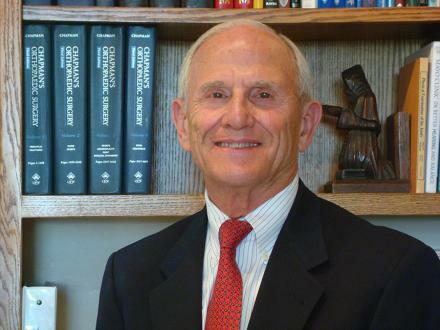 Chapman, a pioneer of modern trauma surgery, was chair of the UC Davis Department of Orthopaedic Surgery for two decades and was chief of the Orthopaedic Trauma Service. 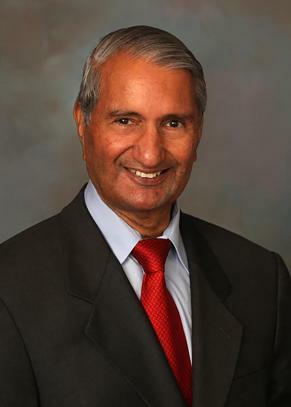 Under Chapman's leadership, the department became one of the most respected in the nation. An alumnus of the College of Letters and Science, Chapman has been a generous volunteer and donor for many years and is one of the founding members of UC Davis’ first comprehensive, $1.3 billion-generating campaign. 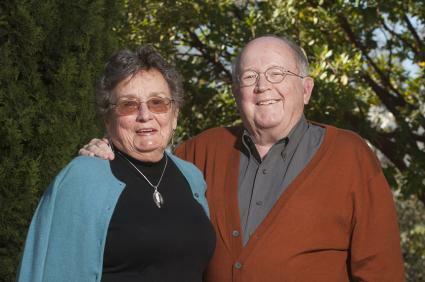 The Chapmans are members of the UC Davis California Aggie Alumni Association, the Davis Chancellor's Club and Emil Mrak Associates, and helped make possible the Walter A. Buehler Alumni and Visitors Center and the Robert Mondavi Center for the Arts. << See video.